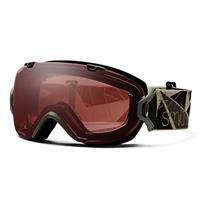 This goggle is a great piece for women! Fits a women's face very well, not too bulky, great goggle! 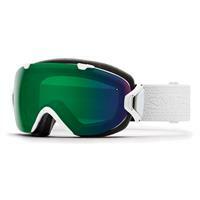 Love this goggle, great for smaller faces and the chromapop lens quality is amazing. Totally enhances the terrain and makes the experience just that much more enjoyable. Also for the price you get two lenses which is a steal. small/medium fit goggle that comes with another interchangeable lens. Cons: It does not switch out easy enough to do on chairlift. 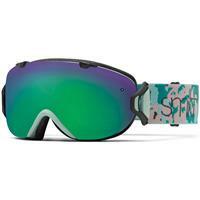 Great for skiers concerned with vision issues as you get 2 lenses with your frame. This frame is smaller which fits most women better. Can pair with a Smith helmet for total package performance . I have a small face and am hard to fit for goggles as everything always looks big on my face. These fit great because they are made for smaller faces. I love the color selection and was able to match them to my helmet perfectly. The goggle/helmet integration is seamless and doesn't leave any awkward gaps or spots that are uncomfortable on the face. I also love the fact that it comes with 2 lenses - one for brighter days and one for low lights. I/OS are my favorite! 2 lens that are incredibly easy to interchange and perfect fit with my Smith helmet. Worth every penny! Awesome goggle that makes lens change incredibly easy. Smith lens quality is excellent, so having a low light and daylight lens is great for all-day riding. Fantastic google, great seamless fit with my Smith helmet. Easy to change out the lens and gives a nice range of vision. Love how the frame fits well on a smaller face. Great Goggle. wonderful fit and comes with two lenses. 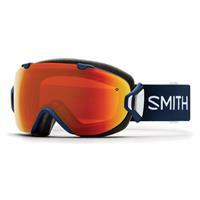 The Smith I/O series is the answer to your peripheral vision prayers. These googles lack the typical, bulky goggle frame that most people find to be constrictive to their vision so you won't be struggling to see side to side in the I/Os. The I/OS is a smaller goggle and comfortable for anyone with a smaller face without sacrificing any visibility or coverage. They are still compatible with most helmets so you won't feel any gaps between your goggle and your helmet! Slightly on the higher price point of goggles, the I/Os come with two lenses and the quick change system makes it a breeze to change them out. When you start the day off with a blue bird sky and your bright lens but the day turns overcast just after lunch, you can quickly and easily pop in your low light lens right on the mountain. Cons: Have to know how to change lenses, but it is easy to learn. Great multi-purpose googles. These goggles come with two types of lenses - a low-light (cloudy days) and high-light (sunny days) lens. Great value for the slightly-steep price tag, but you'll never need to buy another goggle ever again. Love this goggle! Great fit with my Smith Helmet. Comes with 2 lenses that are easy to switch out! I love the way the Smith I/OS fits with my face shape and my Smith helmet. The field of vision is great, and most lenses work in a variety of conditions. The lens is easy to change and fits comfortably in my jacket pocket. 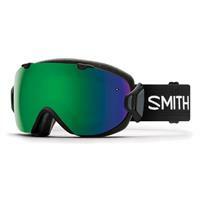 I've been using Smith goggles for years because Smith has a great ladies line of goggles. Their frames fit smaller faces really well. The I/OS goggle not only looks and fits great but the quick changing lens capability makes for a great tool in your ski bag here in the East where lighting can change from flat light grey in the morning to bright sunlight in the afternoon. Great Google for women, easy to change out lenses and fits small faces. This Smith Goggle is perfect for small frame faces. Very comfortable and compatible with most helmets. Simple and quick to change the lens while on the mountain or lift. Huge fan, will recommend to everyone. 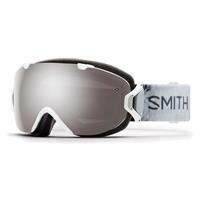 The Smith I/OS is a great small fit goggle for women, with an excellent field of vision. Lenses are super easy to change.